Description: Local jobs at North Yard. Description: Several patched fallen flags are the consist for a train being made up in this Denver yard. Description: Another view of the Patched Fallen Flags train consist. Description: UP 1405 heads back to Pueblo with the Canon City Local after picking up at the W.Clark Power Plant in Canon City Colo. Description: Colorful consist on this manifest train as it heads north through Colorado Springs. I could tell this would head over the Moffat since it had a DPU on the rear. Just another Trash Nine though. Description: Nice to see an ex-Cotton Belt every now and then! Description: Trailing in the lead power on a westbound rail-train. Description: A SSW unit paired with the DRGW. I can handle this. Description: The UP local power sits shut down, while a empty BNSF coal train passes on the mainline next to it. Description: UP 1405 is between assignments at UPs yard in Belvidere, IL. 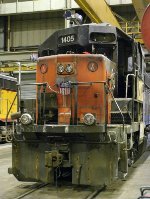 Description: UP 1405 waits between assignments at UPs yard in Belvidere, IL. Description: UP 5245 & 1405 wait between assignments at UPs yard in Belvidere, IL. Description: UP 1405 & UPY 554 work a cut of autoracks at Belvidere, IL. Description: Y-SPBN takes a transfer to Northtown Yard. Description: A pair of UP GP40-2s switch around, shoving a rather large cut of cars. Description: Job 01 spots some cars. Description: Eastbound LTA42 approaches Bridge Junction at 1348. Description: Built January 1979 as SSW 7652. Description: Six engined mixed freight, getting ready to stop, and leave the three geeps on the yard track.